Tracked by their calls at night after heavy rains, two species of narrow-mouthed frogs have been recorded as new. During the examinations it turned out that one of the studied specimens is a hermaphrodite and another one represents the first record of the genus Cophixalus for the Misool Island. The field work, conducted by Steve Richards, South Australian Museum, Adelaide, and his team, took place in the Raja Ampat Islands, Indonesian part of New Guinea. Their findings, compiled by Dr. Rainer Guenther, Museum fur Naturkunde, Berlin, are available in the open access journal Zoosystematics and Evolution. Belonging to the narrow-mouthed frog genus Cophixalus that occurs mainly in New Guinea and northern Australia, the two new species have been differentiated by their morphological features along with the specificity of their advertisement calls, produced by males to attract their partners. Both are characterised by small and slender bodies, measuring less than 23 mm in length. Curious enough, when dissected one of the male specimens, assigned to the new species C. salawatiensis, revealed a female reproductive system with well-developed eggs. Simultaneously, neither its sound-producing organs, nor its calls differed in any way from the rest of the observed males from the same species. Therefore, it is to be considered a hermaphrodite. 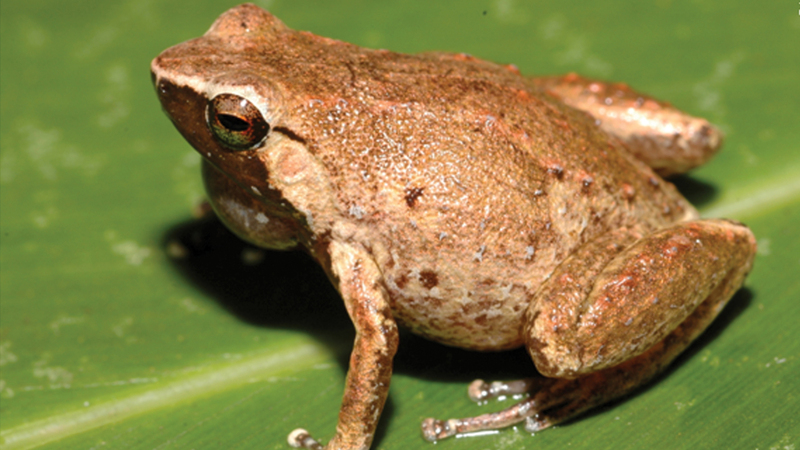 Both new frog species have been retrieved from logged lowland rainforests. There the scientists noted that after heavy rains at night the males perched on leaves of bushes and produced sounds, characteristic for each species. All specimens have been placed in the collection of the Museum Zoologicum Bogoriense (MZB) in Cibinong (Bogor), Indonesia.